Berryhill's is the local hot-spot for big ’ritas and fish tacos. : It all started in 1928 when a man sold tamales out of a pushcart. Today, several owners later, the name Berryhill’s Hot Tamales is a misnomer. Sure, tamales are still on the menu and, yes, they’re even spicy. But people who frequent Berryhill’s don’t just go for the tamales. They go for their fix of Houston’s best fish tacos. 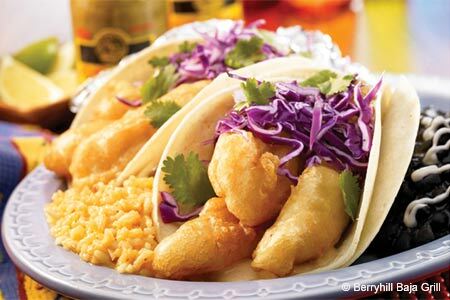 The sweet, beer-battered fish is enclosed in two warm corn tortillas, spotted with a tasty rémoulade and stuffed with red cabbage and cilantro. For weight-watchers, there’s a grilled version of the fish as well as decent shrimp tacos but, honestly, these pale in comparison to the original. The casual walk-up counter café features a full menu of Tex-Mex offerings, from enchiladas and quesadillas to the namesake tamales. A salsa bar offers a variety of mild-to-hot sauces to enhance your meal and a full bar of libations presents another kind of enhancement altogether.